More than 80 people from across the world have responded to an appeal for volunteers to sew up rescue sacks for lost puffin chicks on St Kilda. The National Trust for Scotland made the appeal in December. 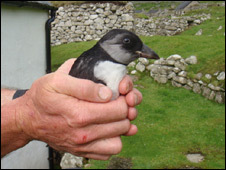 The conservation body hoped the drawstring cotton bags would allow ranger staff to safely transport and release lost pufflings. The young birds often become confused by lights on the Scottish island and end up inland instead of out at sea. St Kilda property manager Susan Bain said she now had more than 100 high quality bags to see her through the next few summer seasons after volunteeers came forward from as far afield as Australia and Thailand. She added: "We have been astonished by the response to our call for help. "Thanks so much to everyone who has donated their time and expertise to ensuring that our puffling chicks on St Kilda are safely transported back to the coast when they get a bit lost."